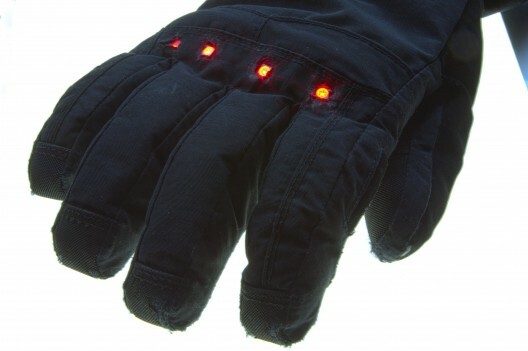 Thrilled to have been mentioned on Adafruit’s Ask an Engineer live webcast last week, I decided to write up more about my glove project. Here is a quick 6 second video. Using Adafruit’s open-source Arduino compatible board, the Flora, a GPS module, and four RGB LED “pixels”, I adapted a North Face Hyvent glove to passively respond to my location on earth and to relay data. Mostly for fun but I can see where this could be useful to someone in situations. I’m discovering some limitations along the way as well. 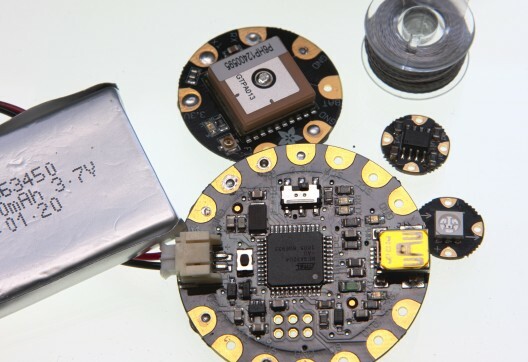 The project is basically a fork of Adafruit’s own excellent Flora GPS Jacket tutorial. You can find their code on Github. I’ve added coordinates for all the lifts on Whistler Blackcomb in an array that get checked against my current location. If within a specified range (10m) the LEDs blink a calming red pulse (or warning). Altitude, time, location and speed are displayed by a unique animation indicating the data type; the numbers are then blinked in base 10 sequence across the fingers. Digits on digits. I’ve got it set up to also indicate when I’m above a mile high (1609m) and to do other functions at precise times or locations. Get moving over twenty knots (37kph) and the lights flash alternating blue and red for a police chase effect. I purposely let the glove do it’s thing and be passive rather than introduce controls to make it interactive. Building the glove was made easy by the design of the glove, or so I thought. 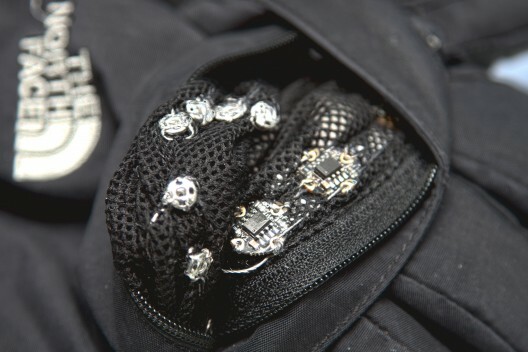 The mesh inside pocket on top of the glove easily houses everything and the mesh makes weaving conductive thread easier. Working with conductive thread was *by far* the hardest part. Thread with a mind of it’s own. Nail polish as a knot sealer is the key here. Snaps sewn inside allow the Flora and GPS boards to be removed and used in other projects. It’s holding up after a few days wear-and-tear skiing and snowshoeing except around the LEDs where the fabric is lifting. I’m still experimenting and fixing little things. Next steps are to add logging. Once stable I’ll share it on Github. This entry was posted on Tuesday, March 19th, 2013 at 11:22 and is filed under Electronics . You can follow any responses to this entry through the RSS 2.0 feed. Both comments and pings are currently closed.